… Along the way, however, we’ve forgotten something important — namely, that economic justice and economic growth aren’t incompatible. America in the 1950s made the rich pay their fair share; it gave workers the power to bargain for decent wages and benefits; yet contrary to right-wing propaganda then and now, it prospered. And we can do that again. Yes, because business will certainly prosper with an added burden of a 91% tax rate on the wealthy, and a corporate rate double what it is today. It will surely create a scenario where wealthy business owners and small business owners alike will announce thousand upon thousands of job openings. 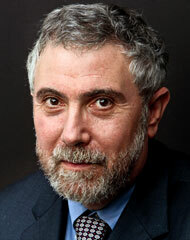 It’s no wonder Krugman is heralded as an economic hero in liberal circles. Reality however, offers a different vantage point.